What better way to tell someone to keep in touch after the holidays than with a beautiful, personalized pen? With a sleek, lacquered finish, balanced weight and packaged in a luxury gift box, the Carbonesque Executive Pen is sure to make an impact. Laser-engrave your recipient’s monogram on the clip for a classy, individualized touch. Bring the cheer to your next holiday gathering in a beautiful Leatherette Wine Bottle Bag! Full-color imprinting allows you to customize this bottle bag with an image or up to four lines of text. This is an excellent gift whether you fill it with a bottle or not, and it pairs well with the Personalized Wine Accessory Set for enthusiastic wine lovers. Give a personalized gift that’s worth toasting! Myron has an unconditional, 100% satisfaction guarantee to ensure that your personalized gifts are exactly right every time! 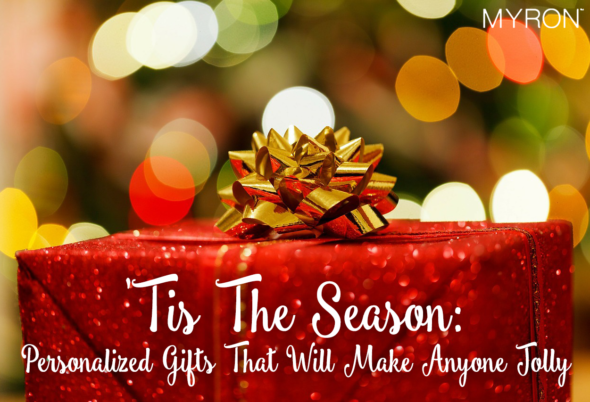 For more gifting ideas for family, friends, employees, and clients, explore the rest of our blog.